Welcome, and thank you for visiting Saurette.com. Here you will find an extensive repository of information about one-quarter of my family history. This site is concerned with the ancestors of my grandfather Roland Lawrence Oligny. Roland’s father had the Oligny surname and his mother’s maiden name was Saurette. 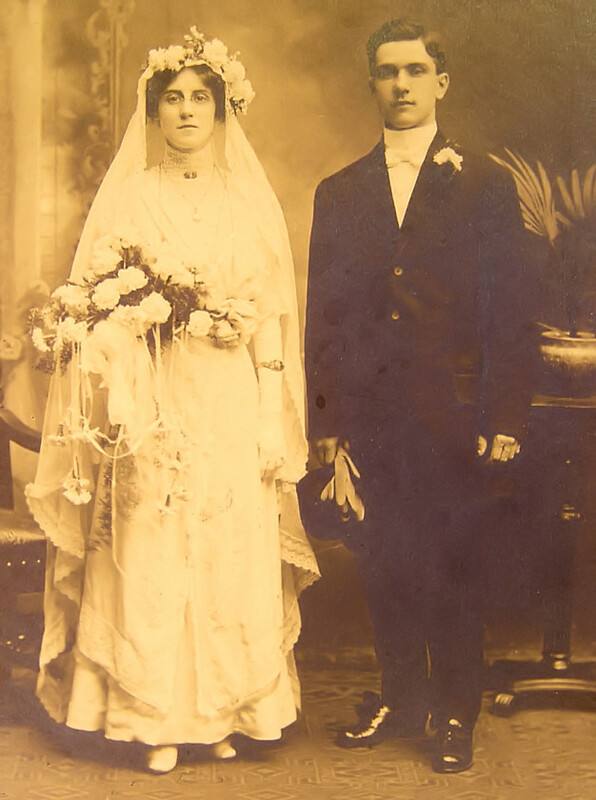 In fact, here’s a photo of the happy couple that started my genealogy research: Marie-Anna Saurette and Joseph Philorum Oligny. Database Changes: Finally got around to uploading my latest data. Been a while. I just switched to a different genealogy program on my computer. I started adding in some vital event dates from the PRDH. My name is Steve Rock. Please feel free to e-mail me at [email protected] with questions about what you see on this site or maybe about your own French-Canadian ancestry. My database contains thousands of French-Canadian surnames, and if you find yours, I might be able to shed some light on your family. If you’re just casually browsing, then I hope you enjoy getting a glimpse at my immigrant family. This site now only uses one genealogy software package to display my information – Webtrees – that is where you will find the bulk of my data that is not Saurette or Oligny related. I have sources for the majority of data on my site. If you’d like to know where I got the information, just drop me an e-mail and I’ll get back to you.